Toshiba has released its first attempt at getting near HD quality when viewing standard-definition DVDs. The XD-E500, now available from select retailers, up-converts to 1080p, and gives you three modes to improve the quality of your DVD image. In a preliminary spec sheet, Toshiba outlines how this new player will improve your viewing experience. 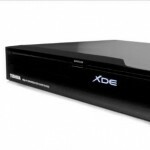 The XD-E500 up-converts to 1080p/24 frames per second (also 720p/1080i/1080p), and outputs video and audio via HDMI. The modes for improving DVD images include Sharp for added edge detail, Color for richer blues and greens, and Contrast for enhancement of details in darker scenes. Some additional video features are the Video D/A Converter (108MHz/14-Bit), Component Video Output (ColorStream Pro), Progressive Scan 3:2 Pulldown (Digital Cinema Progressive), DivX® Home Theater Certified, JPEG, Digital Picture Zoom, Multi-Language Select, Multi-Subtitle Select, and Multi-Camera Angle Select. For audio, it comes with an Audio D/A Converter (192kHz/24-Bit), Dolby® Digital/DTS® Compatibility, MP3 Playback, WMA Playback, 3D Surround Sound, and PCM (pulse-code modulation). Older video outputs include S-Video and RCA, and Coaxial, but I’m not sure why you would buy this machine to output old school like that. The XD-E500 weighs 3.5 lbs and measures 16.93w x 1.97h x 7.80d. Amazon is currently selling the XD-E500 for $179.99, while Best Buy has it priced at $149.